The beautiful Customized Asian Calligraphy Urn is a hand-thrown ceramic cremation urn that has been Raku fired. 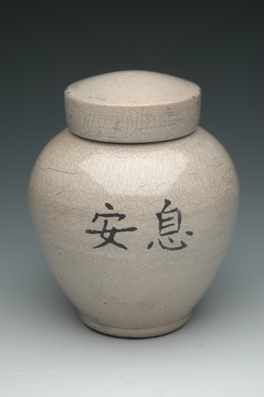 This urn can be customized with up to four Asian characters (shown is the Chinese characters for Rest in Peace). Click here for ideas of Chinese characters to inscribe. Click here for ideas of Japanese characters to inscribe. Click here for ideas of Korean characters to inscribe. Raku is an ancient Japanese firing process where the ceramic urns are removed from the kiln at their maximum temperature and placed in a container filled with leaves, straw or other organic material. The organic material bursts into flame and the container is sealed. The smoke, flames, and oxygen starved atmosphere create the unique textures and colors of Raku. This urn is available in three different colors (urn in photo above is Aqua Luster). Please click on the Detailed Images Tab to review the available colors. Since each urn is hand-thrown and hand-glazed, each urn is a totally unique piece of art; no two will ever be alike. As these are custom works of hand-crafted art, please allow 6-8 weeks before your urn is shipped. The Asian Calligraphy Urn is available in several different sizes to suit your need.